I am all about making my own holiday decor and craft projects and I ordered these red jingle bells because their is so much - craft and decor wise - that you can do with them. 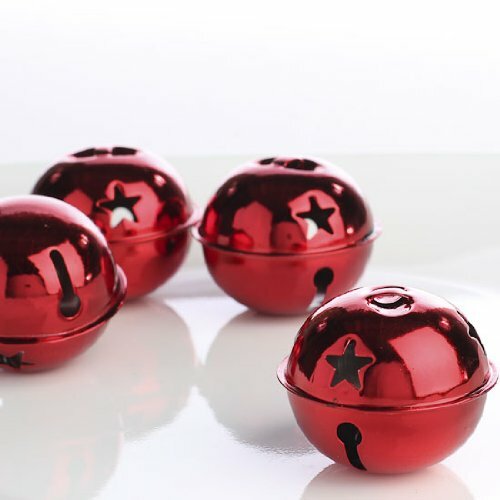 The jingle bells are standard size, red and are very light weight. They come 24 to a pack - which is not bad for the price that they are selling. They have numerous slots and cut-outs on each which are to allow air and sound through them. they have a nice metallic sheen to them and do look very nice. My issue with these jingle bells is certainly not construct or appearance but rather that they are definitely more for show than for the traditional noise that you would come to expect from jingle bells - these do certainly make noise - but it's more of a tinny rattling noise than the all-famous jingle of a jingle bell. Overall though they are great for craft products. These will be great for adding a pop of color to holiday wreaths, swags or adding a bit of flare to creative gift wrapping. Definitely a nice item to add to your holiday crafting stash. Very festive and eye catching. I received this product free in exchange for my honest review I was not paid and did not promise positive commentary. All opinions are my own after having used the product as intended and having evaluated them to the best of my ability.